HEY!! Future Fish!! Wake! Wake! Wake! Wake UP!! YES!! Future Free!! Get! Get! Get! Get UP!! Give me Give me Give me Give me a break! Let me Let me Let me Let me try! Come on, Let’s GO! GO! Come on, Let’s DIVE! DIVE! We can make dreams come true!! Come on, Let’s DIVE! DIVE!! We can make our dreams come true!! This entry was posted in Voice collection and tagged Character Song, Free!, Free! Character Song, Free! Ending, Free! ES ending, Free! 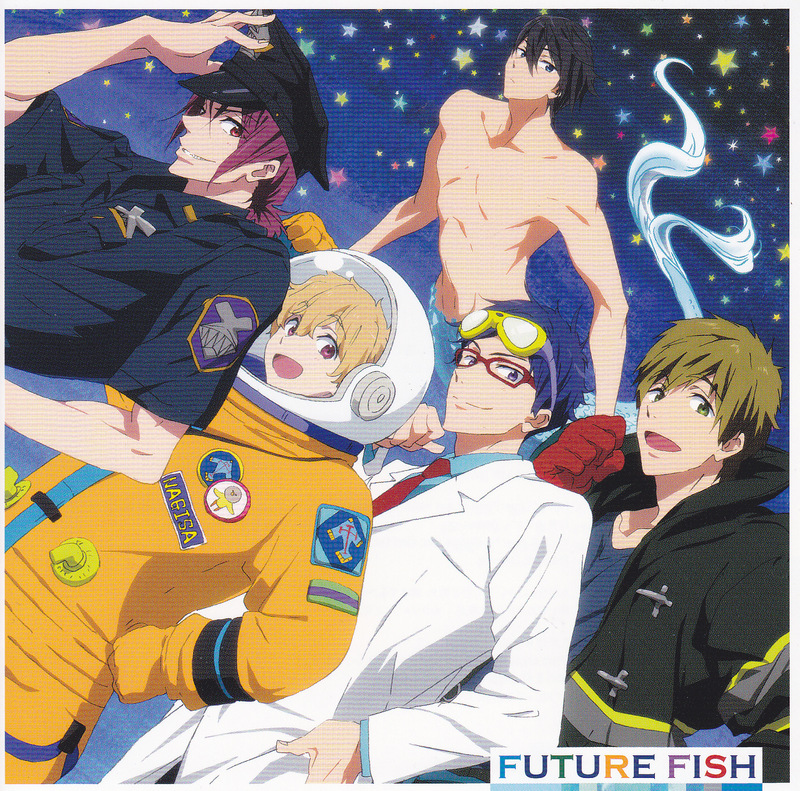 Eternal Summer, Future Fish, Hazuki Nagisa, Hirakawa Daisuke, Lyrics, Male, Male song, Matsuoka RIn, Miyano Mamoru, Nanase Haruka, Ryuugazaki Rei, Shimazaki Nobunaga, Song, STYLE FIVE, Suzuki Tatsuhisa, Tachibana Makoto, Translation, Yonaga tsubasa by shyuu. Bookmark the permalink. I’d love to see a breakdown of the song detailing which seiyuu are singing which solo lines, by someone with better ears than mine. Some of them are pretty easy to identify, Yonaga Tsubasa (Nagisa) and Hirakawa Daisuke (Rei) for example, but others not so much. I’ve been checking all over but nobody’s done anything like it yet. There are a few in Japanese…But you still need to keep in mind that they’re not official, but made by someone. * the first one doesn’t have the full lyrics but only the beginning of each line. For example at the beginning: 【遙】アレは～　【渚】コレは～ is “[haruka] are wa~ [nagisa] kore wa~”. It doesn’t say the full line that would be “are wa muri kai”. Characters: 遙 haruka/ 真琴 makoto/ 凛 rin/ 渚 nagisa/ 怜 rei / 全員 everyone. Though the writers used colours and kept the lyrics in the same format so it should be easy to know which is which. It’s probably harder to follow the lyrics… But they’re not mine so I can’t post them here.